The reason why so many people play the lottery is because players are literally just a ticket away from huge jackpots. Rosalyn Aranda will attest to that. Aranda’s life was normal for a retired pharmacist, till she asked a friend to buy some things for her including a “big winner” of a lottery ticket. 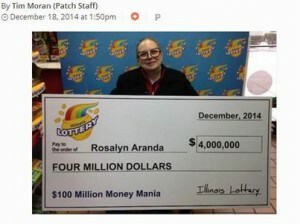 She scratched the $100 Million Money Mania ticket as soon as it arrived and found herself $4 million richer. Now the winner is thinking of savings, investments and playing Santa Claus to relatives. The Citgo Food Shop, 1533 North Waukegan Road in Glenview received a bonus of $40,000 for selling the winning ticket.